Sai Devotee Vikheshwar Karri From India Says: I am Vikheshwar. Jay Sai Ram! I would like to share a miracle of Baba. This is about a dream on 30th October 2017, where in my dream I had Baba’s Darshan and I saw Baba wearing a yellow dress. Incidentally I also belong to Yellow house of MP-122. After some time I just opened my eyes and thought came to my mind that when I get up in the morning let me see if I could be able to see Baba's live Darshan wearing a yellow dress. Now when I got up in the morning and I just opened my Facebook and to my surprise I saw 2 live Darshan and 1 photo of Sai Baba, One live Darshan from Delhi-Lodhi Road and the other from from Shirdi. In all these Baba was wearing yellow color dress and in the photo too Baba was wearing a yellow coloured dress. Sai devotee Neeta Dembla from India says- I am Neeta, Sai Ram to all the devotees. 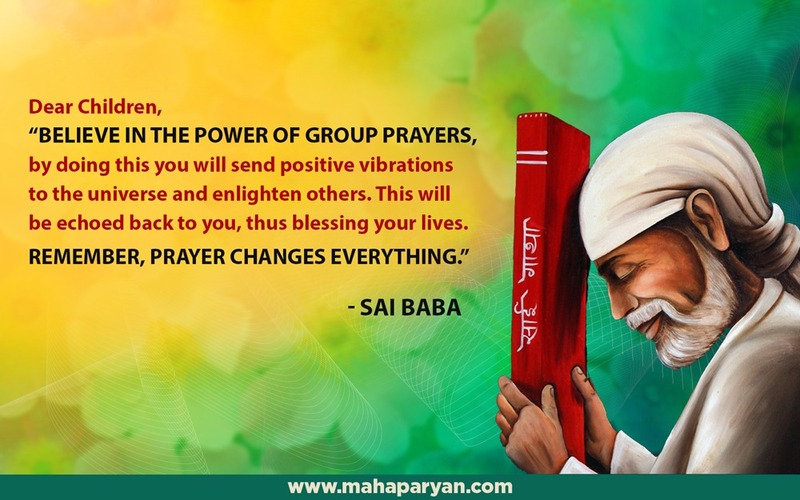 I would like to share a miracle of Baba that I experienced after the Mahaparayan came in my life. Since past 4 to 5 years I was facing a lot of mental and physical afflictions and therefore my mind was restless and I was getting disinterested in my life. Hence on the next day of Mahaparayan, I prayed to Baba that “ Baba you either heal me and give me relief or take me away from this world, now as I am unable to bear the pain”. Shirdi Sai devotee Kineta Garach from India says- I am Kineta, Om Sai Ram, last week on Thursday, 26th October, I was allocated chapter 15 to read of the Shri Sai Satcharitra, This chapter speaks about Mr Cholkar's sugarless tea and the story explains that Mr Cholkar took a vow that if he passes his examination, he would go to Shirdi and thank Baba and receive Baba's blessings. This year was my final year of studying in University and my results were due to be released on Friday 27 October. I was quite worried about my results as all the examinations were extremely tough but I kept my faith in Baba. On Thursday 26th October the day before I received my results, I read about Mr Cholkar's sugarless tea and I was so happy as the story related exactly to my position. I was about to receive my exam results and I have taken a vow to go to Shirdi once I have passed. I knew that by being given this chapter, it was Baba's way of calming me down a little and showing me that everything was going to be fine. Sai Devotee Deepa Jaitely From India Says: Jai Sai Ram, I am Deepa and I would like to share the miracle how Baba made me a part of his Mahaparayan. It so happened that one day my friend from Delhi called me late evening and told me she had received a call regarding Mahaparayan. She asked me too if I was interested to join and I said yes of course but then she said I would be considered only if there was any more space as the group formation was full. So I was keeping my fingers crossed and praying to Baba. And next day I was confirmed that the space is full and next time I will be considered. Sai Devotee Kamal Naraini from Doha says: I am Kamal, Sai Ram to my fellow Sai Bhaktas from the Mahaparayan Groups. I have shared this experience very briefly in my MP group earlier but wanted to mention it for the entire global group. 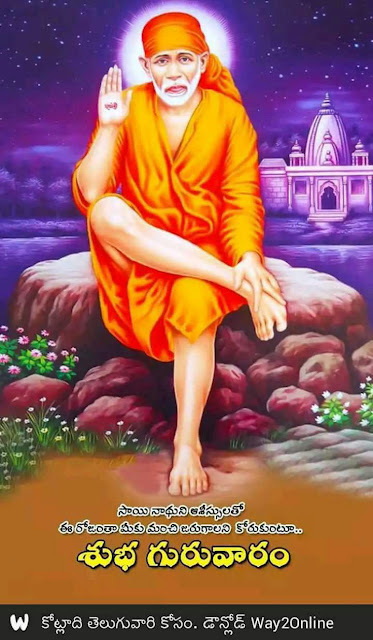 I know we all absolutely believe that Sai Baba protects and provides for us, but have realized that He does things for us to such minutest detail and at the precise time that it's impossible for us to imagine. Anonymous Sai devotee from India says- Om Sai Ram, I consider myself fortunate to be part of this MP group. It was a direct call from Baba. I don't know how and when and what made me join this group. All of a sudden I came across this Mahaparayan site and joined and completed 5th week. I'm a Hindu girl married a person of other religion and that marriage is also a Baba’s miracle and it happened on Thursday. Anonymous Sai devotee from India says- SaiRam, First of all I would like to thank Pooja ji, Hetal ji and each and every one whoever is involved in this Mahaparayan. Here I am sharing Baba's miracle which happened after starting Mahaparayan. For many years I was looking for a good job with good salary as previously I worked in a small company with less salary. Now for the last one and half year I did not have a job due to some reasons. This year from June I had started searching job seriously. I attended interviews and got selected too but due to some issues offer was not released. I was thinking that am unlucky that’s why not getting a job even though I got selected in interviews. Suddenly after the 2nd Parayan(5th October), I got a call from one of those companies for which I had attended interview earlier and they now told me that I had been selected. Sai Devotee Priya Subramanian from Sydney says- Sai Ram I am Priya and as today I was given chapter 27 to read for the Mahaparayan. It reminded me of a Sai Leela and I am happy to share my Experience and Leela relating to this chapter, which occurred around one year ago. It was 2.30 pm on a Saturday, I had finished work and was sitting on a bench in the mall waiting to be picked up. I was reading my Sai’s messages on my phone, when suddenly a young bespectacled man approached me and asked me if the tennis rackets under the bench belonged to me. I confirmed they were not mine. He then asked me if I was from India and I confirmed it. On hearing I was from India, he immediately held out the book that was in his hand and said "We go from place to place distributing books to those who need them." In his hand he held the most Beautiful Divine copy of Srimad Bhagavad Gita. Anonymous Sai Devotee says: Om Sai Ram! I am sharing my experience that happened after starting Mahaparayan. I was diagnosed with a lump on my left breast in May. My General Physician asked me to get a biopsy done and I got it done immediately. By Baba’s grace the reports said it was a benign lump and it’s all good. Then I had a follow up scan in October and had to meet a specialist (breast surgeon) to consult him whether to keep it or get it removed. I was very apprehensive about surgery and prayed to Baba and left it to Him on His feet. Meanwhile I felt little bit uncomfortable in my right breast and I started getting worried thinking that I might have a lump on my right breast as well. Sai Devotee Uma Rajagopala From Chennai Says: I am Uma, Jai Sai Ram and my experience goes like this: On 19th October 2017 I started to catch a flight to reach my city Chennai from Vizag after completing Mahaparayan as allocated to me on Thursday and reached Vizag airport thereafter to get boarding pass but I was informed by the lady staff that the gates were closed now and I could not get my boarding pass. Here I want to remember Bollywood Badshah’s words as told in MERCEL movie, the controversial film that released during Diwali that one who feel themselves as great persons should be treated as an ordinary person on airports then they realize that they are equal to all, even the great actors Rajnikanth and Kamal Hassan also got this treatment on airports as all are equal, this was dialogue of the movie hero Vijay during the opening of the film. Sai Devotee Poonam Pall From Canada Says: I am Poonam, Blue House Captain(Roll Number 13) from MP 89 group. Last Thursday I went to Sai temple on 1190 midway Mississauga and asked Panditji what was the plan for Deepawali. He told me everybody wanted to sit in Lakshmi Puja and it was not possible to invite everyone for the same, so we were doing draw system and one family would be selected, so I should also enter my name for the lucky draw. Knowing this I also did that. Then in the evening I got a call from temple that my name was drawn in lucky drawn for Lakshmi Puja, I was so happy that I can't explain in words, so we did Puja in Sai temple yesterday. It was a unique experience as I felt Baba's presence there. Sai Devotee Hema Vani From India Says: I am Hema, I am a small devotee of Sai Baba from 2013. I was not a religious person before I knew Sai, even though I am from an orthodox family, I was introduced to Sai, by my boyfriend. I am going to share my experience on how Baba blessed me with all my needs. I am in a relationship for the past 4 years now, we planned to settle abroad but found very difficult to secure a job there. Every single day I prayed to Baba, wrote Om Sai Ram 108 times and did Sai Nav Guruwar Vrat and read Sai Satcharitra on Thursdays. Luckily by Baba's blessings, I came for on site work which was very rare for a person working in BPS(Company). It was only because of Baba that I got this opportunity and now working abroad past 1.5 years. Sai Devotee Jesal Desai From India Says: I am Jesal Desai, Green House captain from MP 67 Rajiv Sai. I would like to narrate my experience with Baba Sai Ram as follows- As Baba truly mentioned that He will save all of us from all dangers so did He live up to His promise too in my case, I am so grateful to Him Who saved me and my family’s life from a dangerous accident. While writing this experience my tears are not stopping. On 11th October Me and my family were traveling to Surat for my major operation via NH 8. While we were travelling we met with a dangerous accident. It seemed no one was going to live but by Baba's grace we were all safe not even a single scratch was there on us, It was a miracle. We reached Surat all safe and my operation was successful too, The next day was a Thursday and my husband read my Parayan Chapter with tears in his eyes, I am just a particle of sand near Baba’s feet but still He is so merciful and saved us all. Thank You Sai Maa. I am ever so grateful to Sai Baba and each and everyone who is linked with Mahaparayan, Baba bless each and everyone. Sai Devotee Bhawna from India says: I am Bhawna from Bhawna Sai MP 123 group, First of all I would like to thank Poojai di, Hetalji and Pooja ji from Ludhiana for giving me an opportunity and platform to be a part of Mahaparayan, and last but not least to our Sai Baba Who showered His blessings and chosen me to be a part of this Mahaparayan. I thought to pen down my experience many a times but failed to do so however today by Baba’s grace I am narrating my experience as below.This is related to Mahaparayan, when I first time read on facebook about Mahaparayan, I called up on the given number which was of Pooja di’s, saying that “I also want to volunteer for Mahaparayan and would also like to form a team by adding some people, but soon I realised it was not as easy a task as I had thought as when I talked to people I didn’t get much positive response. Hence I decided to register myself only online and drop the idea of forming any group. I expressed my decision to Pooja di of not forming any group. After some days Pooja di called me again and said she was trying to call me many times but the call didn’t connect. So today she told Baba that if it’s your wish then get the call connected with me, and immediately her call got connected with me that meant Baba wanted me to be a part of this divine project. This really made me feel delighted, Pooja Ji suggested me to maintain 1 group with 48 members and I agreed again for this saying “Ok I’ll try” to which she replied “don’t say I’ll try, say I’ll do it and by Baba’s grace it will be done successfully”. I went for an interview, suddenly I heard one announcement and I was really shocked as in that announcement, they said they will select only 6 among 538 people. Then I decided that I won't be selected and it was good to go back home. Suddenly a thought came to my mind WHY FEAR WHEN I AM HERE. So I changed my mind and stayed there hoping Sainath is with me. Anonymous Devotee From India Says- Sai Ram. Yesterday Pooja Garg Ji shared one devotees’ experience that Baba had given Darshan to her in dream. I was feeling very depressed that Baba does not ever give me His Darshan, thinking like this I slept. Guess what Baba did read my mind and fulfilled my wish. Baba came to meet me in my dream, I saw a long photo of Baba and I was praying in front of Him as I was stuck in a difficult situation and I was crying while I was praying. Then Baba though not talking to me, but with His eyes He was telling me that don’t stop praying and you will soon come out of this problem. Sai Devotee Heena Mehta From India Says: Sairam to all, with great joy I would like to share a wonderful experience, A few days back my mind was not at peace as I constantly had the question in my mind whether I am on the correct path in life as shown by Baba, Since I had lit a big lamp which was getting blown off again and again for the past 2 days thus making me upset. Then on the Mahaparayan day, when I sat down to do my parayan, I spoke to Baba in my mind as follows, “ Baba if I am on the right path in life according to you then this lamp should burn throughout till I complete my Parayan, and it really did keep burning throughout and did not extinguish unlike how it was happening since the past 2 days, My joy knew no bounds, By Baba’s grace my faith was reconfirmed and I got assurity that I was on the right path. Sai Devotee Kavita From India Says: Sairam with Baba's blessings last Thursday i.e. on 5th October I completed my Mahaparayana. Suddenly on Friday morning my husband started worrying as the truck which had about lakhs of door frames and doors was missing. Moreover even the driver was not talking and his phone was also switched off. Possibilities were that may be an accident must have happened or he must have run away. Then the transporter whose truck it was, was also not talking positively. Overall the whole day no sign was there nor any information. I asked him why are you looking tensed? Sai Devotee Nagalakshmi From India Says: Sairam! I love Sai and He loves us more than anyone else in the world. Wanted to share the miracle that Sai did to me day before yesterday. As in the chapter 22 He stands by and protects His devotees from every danger, day before Yesterday I climbed on the stool which was placed on a table and was cleaning the shaft at my home. But suddenly I fell down from the height and the wooden bench fell on my back. It was a complete panic state, but I could remember only one thing in that pain. I asked my to mix Baba's Udi in the water and give it to me to drink and asked her to apply Udi on my back. It was raining heavily, we went to an Orthopaedic doctor. Sai Devotee Payal From India Says: I am Payel Choudhury (roll number 40) from MP-115 Archana Sai Mahaprayan group. We are blessed to have Baba in our lives and Mahaprayan is yet another medium, chosen by Baba to shower His blessings upon us. Coming to my experience, I felt Baba's presence in my room on 01.10.2017, the very next day of our first Mahaprayan. I have a portrait and a small marble idol of Baba placed on my bedside table. I had just lied down in the afternoon and the moment I closed my eyes, I could feel and see a miniature form of the idol of Baba that is present in Shirdi. He had been sitting on a gold throne, a small version of the one present in Shirdi and He wore an eternal smile on His face. No words can express neither numbers can quantify, the divine, the beauteous- enigmatic- charm, that I could see on His face. Strangely, I could sense that the idol was not made of marble, but of an extremely soft material, that I fail to describe. He had been adorning the beautiful black dress that He had been wearing on that same day during the visit of our president to Shirdi, for the inauguration ceremony of Shirdi airport. I could feel His presence for quite sometime. It is an experience of a lifetime and I feel blissful whenever I am reminded of that fortuitous day. Sai Devotee Priya From India Says: I am Priya, single Parent of 1.9 year son. Before marriage I was working as central government employee. After marriage I resigned for job and left abroad. After 2.5 years of marriage and having baby my husband sent me away from home. I faced 1.5 years of domestic harassment and finally I came back to India in June 2017. By July 7th I got placed in a Bank and they informed that I would receive my joining orders soon. But till September I did not get any letter. I was totally depressed, suffering with financial crisis, court case and everything else. One day I saw about Mahaparayan in Facebook and I registered. After registration I was added to a group and fortunately I became a volunteer also. Once I got very much involved during this parayan process I realised all my hurdles started clearing one by one. Sai Devotee Shylaja From UK Says: Om Sai Ram. I am very grateful to Baba for letting me be a part of this team and serve Him through this journey of Baba’s Mahaparayan. Yesterday after finishing our second Parayan I was feeling so happy that I don’t have any words to describe it. It was like a child feeling happy after given a chocolate for no reason. So was I, after completing the Parayan. My team member messaged me that she had received the SSC books which I sent it from here to Netherlands. Then I was even more happy that she had received it on Baba’s day. Then came the goose bumps hour. Sai Devotee Sri Laxmi Says: I am a small devotee of Sai Baba. I always feel Baba's presence around me consoling me, guiding me, helping me, taking care of me. I am lady who believes that love will be never be successful either because of families denial or lover’s trust from my schooling. I always made my mind and heart to love the person whom I would get married and to have one man, one love for one life. But God's plans are always opposite to humans plan. I fell in love with a man who is the best. I used to respect and love him more than our Baba and my family. Baba showed that people can change, their priorities change with time. I realised no one is best other than our Baba. No love is greater than family's love. It was a lesson for me. That man is not bad or good. With time everything changed. I left everything to Baba and surrendered at His lotus feet saying I don't know if he is correct for me or not. Whether I can be happy or not with him and his family. You take decision and lead my life. If he is the one for me make our marriage else make me get married to the person whom You choose. Whoever the person be, I don't care but the marriage should be done on Thursday. If not I won’t marry anyone. I always get positive hints about my love that we both will get married on Thursday as we came together after our several breakups because of our both families. 6 years passed. I couldn't not love or think of any man other than Him. I got job with blessings of Baba. I met a guy who became my crush. I used to think myself if I get married to this guy it will be good, his name starts with Sai, his siblings has name Sai. May be his mother is a devotee of our Lord Sai. I may get chance to pray Baba without any problem and live happily in one of the Baba's sweet home. Whereas with my love as he was Christian they won’t let me say a word also about Hindu God then how would I pray and my love’s mother is very strict, didn’t know how I would be happy when they all dislike me as I am Hindu woman. He then decided to marry the woman whom his parents show. I became fool and lost my education time career in this while. Like this my thoughts were deviating which never happened in 6 years. I again surrendered to Baba saying, I don’t know how I feel. What is good and bad for me. Till now I was so strong to love that man from 6 years even though he lied, cheated and left me. Somehow or the other I thought You will change him and his family members thoughts and You will make our marriage. But now my heart is moving to other man who keeps me happy. And more than that I feel Your presence with him. You select one of the guy with whom I would be happy and make my marriage. I will not love anyone before marriage and get broken like this. Later things got better between me and my crush. Every Thursday we used to wear same colour unknowingly. 1st I thought its coincidence. But later realised it was Baba’s blessings. I got shifted to the desk near to him. We became close. Daily I used to pray Baba if my crush is not Your selection keep me away from him. I'm scared that I will love him. Please control my feelings Baba. Then after I started reading Mahaparayan. On Dussera, I wished him happy Dussera. It was our first communication out of the office. Then on 2nd parayan Thursday, I was very hungry and asked my friend we would go out and eat. There came my crush to accompany me. We three went out to eat. My crush showed his interest in words on me. I felt good. I was just casually working and came home. Next day, on Friday while seeing Baba’s photo I realised all about my crush. May be Baba was telling to forget my past and move on in life without waiting for my love. I don’t know with whom I might get married. I will not love or having feelings for anyone except for the man whom I get married. Because I already went through the pain of losing love. I am not ready to face it again and again. I decided to start my love life after marriage only. I'm very happy that Baba blessed me to spend some time with my Crush happily. Hope you all underatand the feeling when our crush comes to us, show interest in us, how happy excited we be. How lucky we feel.I'm much more happy because all that happened on Thursday. That too durting Mahaparayan journey. All I want to say is Thank You Baba for giving me some sweet memories. I don’t care whether I get married to my crush or not. I am happy to know that he also likes me. I'm happy by spending time with him. It is enough for me. Not only had these blessings, Baba blessed my family so well. In my family, we never celebrated festivals all together. From 10 years we just wore new dress and would be at home. But on this Dussera, my dad who always sleeps till 11 to 12pm on festivals, sees T.V., eats and sleeps again, he himself went out and brought puja samagri, fruits, sweets, wore new dress, did puja to Durga Maa in my home. It was not less than a miracle for all of us. I felt very good and happy where we all were together on festival day. All this started before I started reading Mahaparayan. My mum became busy in cooking prasad for puja and dad was busy with decorating flowers to Durga Maa. I went and lit diya in front of Sai Baba’s photo and surrendered myself at His feet. Then I read Mahaparayan. I got answers that you will be free from debt. We are paying so much interest every month that there are days we starved for some years. In the 2nd week of parayan, Friday, one aunty came and offered money and told to clear all your debts. We just need to pay 6000 for 12months. Actually we are paying 20k every month on interests. It was a great relief for my family members. Now we can clear our debts. Save money for our marriages. We can buy gold for ourselves. You all can understand how much big blessing it was for us. Baba blessed me and my family before reading Mahaparayan only. He made communication with my crush which I tried for many days. We all saw my dad as completely a different person. My dearest friend came to home with sweets who had stopped coming to my home. I used to ask Baba to bring back my love for 6 years. But now I stopped asking. Even if I try to ask again, before asking only I say that Baba You only decide. I will accept Your decision whatever it is. Financial problem is yet to be solved in November at once by which we all would be free from stress, mental sickness, stupid words from others. I feel like all my problems are getting solved one by one. I never expected this much from Baba through Mahaparayan. I thought it would be blessings of my love life. But all the above things happened in my life. It is like all things are getting placed correctly. It was like a miracle to happen about financial problems to end in just 8 to 9 days where I expected all this to happen in at least 1 to 2 years. I understand the difference between 8 to 9 days and 600 days! About my crush I didn’t even have a single thought that we would go out to eat without team. And myself texting him first. About my dad to behave so well like a responsible father. Which all happened on Mahaparayan Thursdays. Thank You so much Baba. Really thanks a lot. Koti Koti Pranam Saimaa. I clearly understood that Your decisions, Your choice is always much better than mine. Actually I stopped asking wishes from Baba from 3 years. I say, I surrender to You Baba, You decide and show me the way. Protect me. Baba made me complete my PG which I never wanted to. Baba gave job and helped us financially. Now when I started Mahaparayan, I told the same, I completely surrender to You Saimaa again and again. This life is Yours. Do whatever You want. Then I started reading parayan. Sai please help me to complete this parayan till last. The only thing got worse is between me and my superior in the office. 1st week there were arguments. 2nd week, Thursday and Friday, Baba showed their true faces to me. Things got worst on Friday, where I didn’t believe myself that I spoke in such a way taking stand for myself, which must have happened 5 months back only. Whether I loose job or not, I'm not bothered because Baba might have better plan for me. I finally stopped going to breakfast and lunch with my superiors who always gossip, who are having 3 to 5 persons with them. I always felt uncomfortable for their bad way of thinking. I always prayed God to give me some good friends. Baba gave friends also and he Himself came in the form of new joinee (Sai Tejaswi) into my team. 1st I her ignored as for some reasons, but she is the one who stood for me and helped me a lot. Now with these arguments, I moved away from superiors and joined with people who are good. This proves that Everything happens for good. I'm glad that I am away from wicked people who have one thing in heart, one thing in mind and say some other words out to the world. I wish and Hope I don’t face any problem in office further. Protect me Appa. I am scared. And Baba has showered his blessings in all possible ways. Thank You so much. I am so sorry for the very long post. Thank you all for reading it patiently. Om Sairam. Jai Sairam. Sri Sairam. Sai Devotee Vijaya Says: Dear All Devotees my experience starts like this: On night of 30th that is on 1st October midnight, I got a dream that I finished reading some big book, it was very a big book like a Granth. Then immediately an eagle came and sat on my head and pressed my head with it’s big claws like a mother presses head of her child. I felt that why an eagle; as eagle is inauspicious but deep in my heart I felt that its Baba Who has kept His hands on my head and assuring me that sleep peacefully because I was struggling for sleep for past 2 weeks due to nightmares of spirits and ghosts which may sound ridiculous to all. But I was really suffering with uneasiness. Then the next day when I woke up I was so fresh as I never had such a peaceful sleep. I am busy with my exam preparation which is tomorrow(5 October 2017) so I just ignored this incident. But just now when I boarded train for office, something happened and I wished in my heart that if I open my mobile, I should see Baba first. And lo it was the MP-126 team experience. After reading that experience I felt Baba wants me to share my experience also with others. Later I gave my exam on 5th which was like one of the toughest exams of the world and no one achieves qualifying scores especially in 1st attempt. But as always said "Why fear when Baba is here", and my Baba made it a miracle. I cleared my exam with overall score of 73 % which is good for me. Sai Devotee Divya Murali Says: Hello Sairam, yesterday night (6 Oct 2017), I had a dream where I kept walking in some streets, somewhere in Chennai. I was looking for a Goddess temple and trying to find out where it was. With someone’s guidance on the road I finally reached the temple. The whole temple was very crowded. Everyone was talking about Mahaparayan and they said it was a special Thursday today because of Mahaparayan. I didn’t understand why they talked about this in a Goddess temple. But to my awe, when I entered, I saw a huge Baba statue in the Garbagraha (centre) of temple. I felt so happy! Sai Devotee Rakhi From USA Says: Om Sai Ram. I am Rakhi Lalit Balwani a very small devotee of Baba from USA. On August 31st my friend Neetu Jain told me about Mahaparayan and I registered. After reading about Mahaparayan on www.mahaparayan.com, everything seemed to me as a dream. But that was not the dream. It was proved real by Poojaji Garg and Hetalji. Within few days got a call from Harishji that he was including me in his team. Later I was included in Mahaparayan Khichadi (Brahmha Muhrat Parayan) through Anita Gupta and Kanikaji. The thought that all the devotees from Khichdi group doing Mahaparayan from 5 different continents holding 'The Sai Satcharitra' at the same time gives me goosebumps and shivers my body. Poojaji You made it possible! Early morning I got ready and went to Sai temple to read my chapter. After the completion of my chapter the priest of the temple started preparing Baba for morning abhishek. There were 2/3 aunties who were cleansing Baba's charan with water and milk. I also started doing the same. Then pandit ji gave me water to clean charan. After Baba's bath arti started. Many people came for arti. Suddenly Panditji asked me to do Baba's pooja. I did pooja of my Baba in His temple. I felt so blessed! Sai Devotee Sunitha says: Jai Sairam, Thank you so much for giving us this golden opportunity to be a part of Baba's MahaParayan. I would like to share this leela I experienced related to Baba's MahaParayan. For reading a chapter on Thursday, Septemeber 28th, (trial run for Mahaprayan reading that was conducted by our leader) we had to pick the same chapter that we were supposed to read on Baba's MahaSamadhi day, September 30th and this I was not aware of. Sai Baba came to our house. He was very weak. His teeth were missing. He seemed to be of very advanced age. He was at our door standing and my wife happily invited Him inside the house. She then made Him sit. Baba then said that He was very hungry. My wife had prepared Kesari bath (Sheera in Marathi/Hindi). As He was old, my wife fed Baba with her own hands. Then Baba finally said that His hunger was satisfied. He then got up and kissed my wife on her forehead and told her not to worry and "I will be always with you". Hearing Baba at our house; my wife's mother and her eldest brother came running to our house with food to feed Baba. With this her dream got over. Sai Devotee Gayatri from Ireland says: Om Sairam. Hi I'am Devotee from Ireland. I am blessed to be a part of this Baba's MAHAPARAYAN. I am very Thankful to Hetal ji and Pooja ji as through them I got to know about this opportunity. Let me share my dream with you. It was a great awaiting day of MAHAPARAYAN. Early in the morning around five may be I saw a dream. It was dark and I saw bright light which was just like outline of Baba from His feet forming up to head and I noticed that a thread was tied to His leg, somebody was accompanying Him. Baba was holding a stick and a bag. As the Baba's outline formed, He immediately turned back and I noticed some letters were written on His back. By the time I realized those letters my mind read them as chatra chapna( Hindi letters). Then I was thinking what was this and what were those words? Slowly I tried to read the letters they were written in Hindi language. They were the same letters what mind had read.